Sabancı University VACD program students are currently participating in the “Artist 2007-17th. 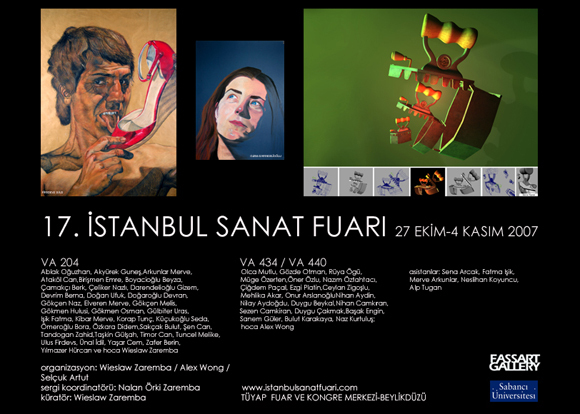 Istanbul Art Fair” together with their instructor Wieslaw Zaremba at Tuyap Exhibition and Congress Hall in Beylikdüzü until November 4, 2007. Sabancı University’s exhibitions organized by Wieslaw Zaremba take part in the Fair since 2003 as the University is provided an individual exhibition space for 400 sqm. Having the chance to exhibit in the art circle and market at Tuyap Istanbul Art Fair the students have also been gaining experience in preparing their own exhibitions during their study times. The works by 35 students attending “Language of Drawing II” instructed by Wieslaw Zaremba and 21 students from “VA434 3D Animation” and “VA440 Video Graphics and Art” courses by Alex Wong at FASS are displayed in the exhibition. The exhibition can be visited at the Tuyap Exhibition and Congress Centre until 3rd November 2007 from 11:a.m.to 8 p.m. and the closing date of 4th of November from 11 a.m. to 7 p.m.